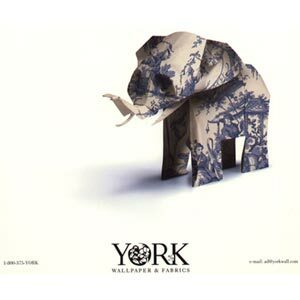 One of a series of three advertisements for York Wallpaper & Fabrics. Obviously, this model was based on the earlier elephant done for K.I. Lipton. Unfortunately, the wallpaper was a little too springy to fold well, so the final model was folded from white parchment paper, and the wallpaper texture was added by computer.